Precious metals futures ended mixed Thursday with gold and platinum higher and silver and palladium lower. Gold for December delivery added $3.80, or 0.3%, to settle at $1,287.50 an ounce on the Comex division of the New York Mercantile Exchange. The settlement is the highest since Oct. 19. "The buying pressure in gold … seems to represent a minor shift in allocations from equities to the metal," MarketWatch quoted Brien Lundin, editor of Gold Newsletter. "The fact that silver is underperforming gold today also indicates some level of safe-haven demand, as opposed to monetary drivers being behind the move." 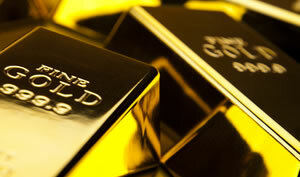 Gold futures traded from a low of $1,280.50 to a high of $1,289.50. They rose 0.5% in the previous session, declined 0.5% on Tuesday, and advanced 1% in their start to the week on Monday. Meanwhile, silver for December delivery declined 16.3 cents, or 1%, to close at $16.975 an ounce. Silver futures ranged from $16.91 to $17.15. They advanced 1.2% on Wednesday — ending at their highest price since Nov. 2, dropped 1.7% on Tuesday and jumped 2.4% on Monday. January platinum gained $2.70, or 0.3%, to $940.60 an ounce, trading between $932.30 and $942.30. Palladium for December delivery fell $11.40, or 1.1%, to $1,004.40 an ounce, ranging from $1,001.85 to $1,023.25. On Wednesday, the metal closed at its best level since February 2001. Gold edged up 80 cents, or less than 0.1%, to 1,284.80 an ounce. Silver added 10.5 cents, or 0.6%, to $17.10 an ounce.